Today is the 37th birthday of singer and actress Brandy!! Wow! 37! Where has the time gone? I still remember getting my copy of her second album Never Say Never in 1998. And my sister just adored her debut self-titled album released in 1994. 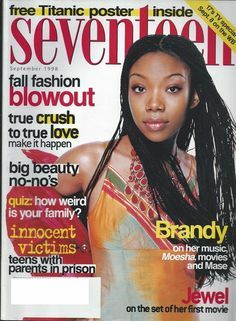 I also bought my first issue of Seventeen magazine, with Brandy on the cover, in promotion of Never Say Never. Her 2004 album Afrodisiac is, however, her true and commercially underrated magnum opus. Such a fantastic R&B album with an overload of honesty, her growth as an artist willing to be more vulnerable than ever before really shone through the either impressively futuristic R&B sounds or simplistic sparkle-lite piano samplings of Coldplay. It was nominated for Best R&B Contemporary Album at the 2005 Grammys but criminally lost to Usher‘s Confessions. Usher’s huge album, that nearly defined his career more than My Way, was memorable, but the truth of Afrodisiac still stings today and will get you through your darkest hours. It got me through mine. I hope she’s proud of it as much as those that’s it’s touched! True story, I actually teared up when I got to chance to meet Brandy at a dinner party held for her in her honor at the Harlem Haberdashery, an independently run clothing store in Harlem. The party was hosted by PYNK Magazine and she was a staying in New York at the time because of her role as Roxie Hart in the iconic Broadway play Chicago. No one had told her about it and both she and her makeup artist, Renny Vasquez, walked in and were greeted with loud yelps of “surprise!” Vasquez was aware it was magazine-related but not that it would be a dinner! After a toast, everybody ate and mingled, but there was also a photo booth with props to take pictures with. A lot of press was there (I was present because of a press invite) but we all became fangirls at the sight of Brandy and shortly after, we waited in a short line to take a photo with her. When it was my turn I almost burst into tears. All the times I played Afrodisiac went through my head and I had to let her know. She appeared instantly moved and placed her hand on my shoulder. I even told her that I had gone to the movie theater to show love for the sequel, I Still Know What You Did Last Summer that she starred in alongside my other ’90s teen queen, Jennifer Love Hewitt. (One time for my mom who tolerated the movie because I wanted to see it). I was so embarrassed but sometimes I think that for artists when an album doesn’t sell as well or win a boatload of awards, that their latest project went unnoticed. That is not true and sometimes is actually the opposite. She appreciated what I had to say and gave me a hug and we promptly took a photo together. Later on, in about an hour, she began to put her coat on so she and Vasquez could head on. Another Chicago show was scheduled tomorrow night. I recall when a guest asked her why she was leaving earlier than usual (she knew this person), Brandy answered incredibly earnestly: “You got to be magical every night.” Brandy’s appearance in Chicago was even expanded last summer of 2015 because ticket sales had soared from fan demand. While Afrodisiac is my favorite and NSN is a close second, every album of hers got hits on it. 2016 also marks the 20th anniversary of the television series she starred in, Moesha (“Moe-to-the-A, E-to-the…”) and eighteen years since she played Cinderella opposite Whitney Houston in the ABC TV movie adaptation that scored massive ratings in 1997. And today is the fourth anniversary of the passing of the legend and Brandy’s greatest inspiration Whitney Houston. (Brandy named her last Two Eleven as it commemorates both her birthday and Houston’s). It’s still hard to believe she is gone. An icon long before her too soon death, she is missed. Below is her singing “That Star-Spangled Banner” at the 1991 Super Bowl XXV.